This rustic Italian classic makes a quick dinner. Because the main ingredients are bacon and eggs, it also occasionally turns up as a brunch dish. Bring a large pot full of salted water to a boil for the pasta. While the water heats, cook the diced pancetta or bacon in a small pan over medium heat until the diced cured meat is thoroughly cooked. Remove from the heat. If using the garlic, slip it into the hot bacon fat and stir a few times. Put the meat-and-garlic mixture into a large serving bowl. Cook the pasta in the boiling water until al dente. Meanwhile, whisk together the eggs, olive oil, and half of the Parmesan. When the pasta is done, drain it and quickly put it into the large serving bowl. 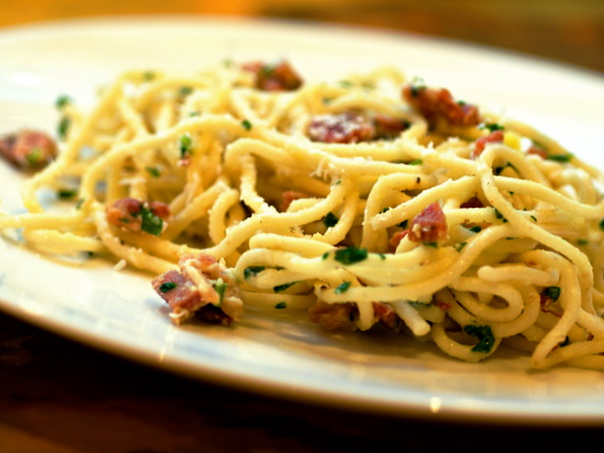 Toss the pasta rapidly with the cooked pancetta, then pour over the egg mixture and toss well. Serve immediately, passing the remaining cheese, salt, pepper, and optional parsley at the table.